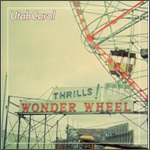 The first time I heard Wonderwheel, I threw up. Part of it resulted from a binge my new next door neighbor and I were on. We spent our early summer San Diegian nights trying to find the new cheapest but best tasting bottle of red wine. What we saved in dollars and cents was paid for in spades by morning. But as an outsider in a brand new city that was now home, it was a great way to meet a new friend. I got an advanced copy of Wonderwheel in the mail. I’d heard bits and pieces of unfinished songs when I was back home in Chicago over Christmas. But, I now had the finished copy in my hands. And when I put it on, I just couldn’t believe it. I was so pumped at what I was hearing that I literally barfed. What struck me first and always has since with each Utah Carol album is the marriage of two voices that sound so right together. When you hear two or more voices turn into one, it doesn’t seem possible. Not to compare, but to demonstrate that the phenomena does occur, think about The Everly Brothers, The Beach Boys, or Gram Parsons singing with The Byrds. Think “Hickory Wind.” Haven’t you ever heard something that just knocks the wind out of you? If the conditions are right, maybe you’ll gag a bit too. From excitement. In a world this big, what brings two strangers together who end up equaling more than the sum of their parts? As for the specifics of the album, a few personal favorites are the odes to two influences, “Boon” and “Miles,” the gorgeous twang of “Buffalo” and the hope and despair that is wrapped as one in the beautifully heartbreaking “Scattered.” But with twenty songs crammed in forty-five short minutes, there is certainly no reason to miss a precious one of them.